Some Moments in Life are Worth More than others. The Luxury of Private Spa Bodycares is one of those moments. 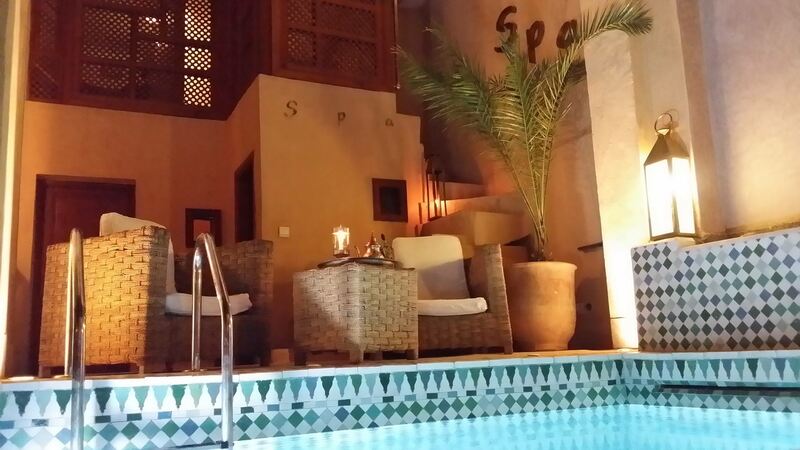 You will Relax as soon as you will be entering Riad Al Ksar and its Private Family Spa. During a weekend break or more, enjoy the Best benefits of Spa Packages Bains in Marrakech with hot water and Moroccan Natural Wellbeing treatments in our Private Family Spa area. With our offers for Unisex Spa Treatments and Swimming Pool access, Relax at the Riad Al Ksar, Boutique Hotel Spa in the heart of the Medina of Marrakech. The Spa includes a DUO Moroccan Steam Bath, a DUO Massage Room, a beauty cabin for Esthetic Cares and a Swimming Pool within an intimate riad of charm, calm and luminous, ideal for relaxation and quietness. 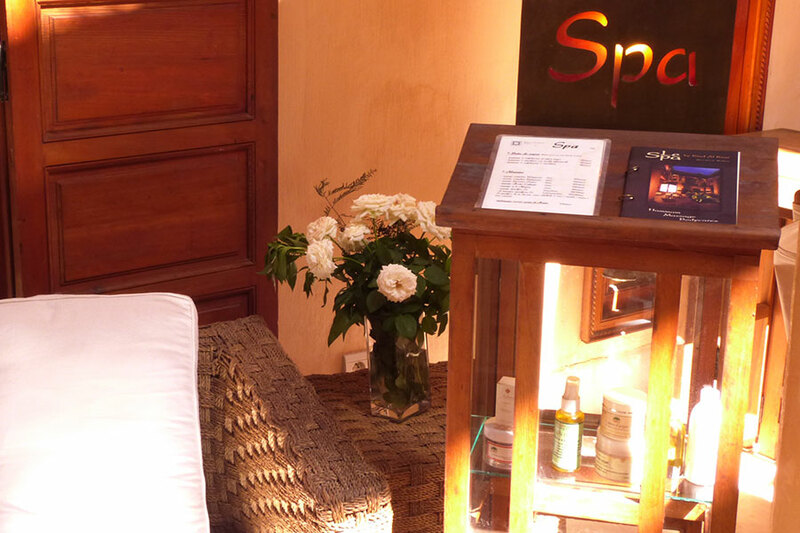 Ideal for Couples, our Spa Packages Bains in Marrakech include Hammam & Massage Treatments. 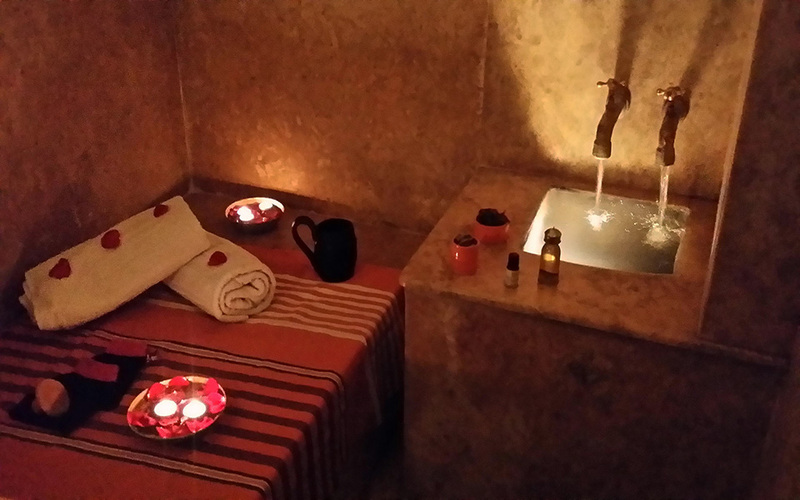 Cares are provided in Unisex Duo (Man/Woman) Hammam Steam & Massage Rooms, in the Medina of Marrakech. At the Riad Al Ksar & Spa, Traditional Moroccan Hammam Cares are carried out in the respect of the tradition of the peeling and then the wrap, flavored with Eucalyptus Essential Oil. In Morocco, the Hammam is associated with Black Soap Scrub and Rhassoul Clay Wrap treatments, which multiply the wellness. 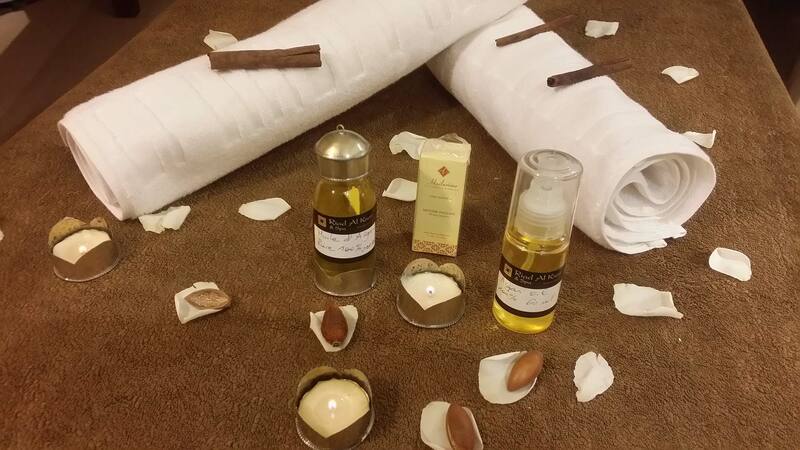 The Moroccan Massage, ideally with Pure Argan Oil, carried out immediately after a Hammam Care, has a beneficial effect. The Best of Moroccan Wellbeing Treatments includes Mixed Spa Cares, in Duo Rooms, ideal for couples. Discover the magical atmosphere of a Riad with its Private Spa area during a traditional DUO Mixed Moroccan Hammam & Massage care with Access to the Pool & Terrace included. Information and Reservations for the “Day Spa” (Half Day Spa Care) can be made by email at contact@alksar.com or téléphone or SPA BOOKING FORM. The Spa products used by the team at Al Ksar, such as Argan oil, Rhassoul Clay, Black Soap, essential oils, masks, flavored waters and soaps, are made by Natural “Bio certified” Moroccan laboratories or processed manually with 100% Natural methods, without additives. The Ghassoul Clay and the Black Soap are naturally produced in Morocco. All products used in the Spa of Riad Al Ksar are available for sale in Gift Box in the Riad Corner Boutique, to pamper yourself or your relatives and friends with Natural and Cheap Moroccan Well Being Products.